Titanic Human remains found 100 years after sinking? 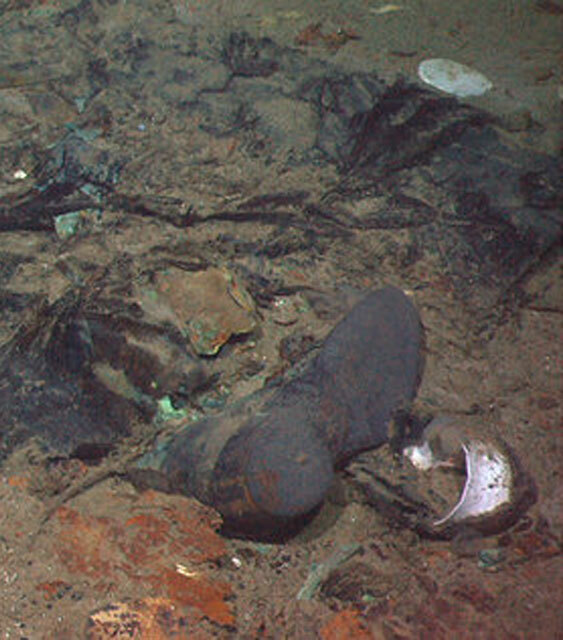 Home Photos Titanic Human remains found 100 years after sinking? Human remains may have been found in the sea-floor of the Titanic shipwreck after 100 years it sank, as Associated Press reports. 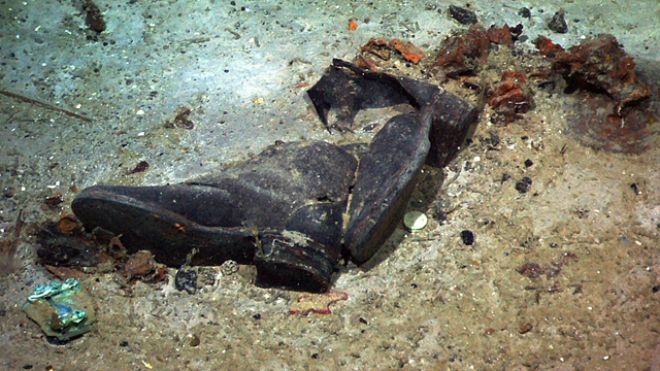 A 2004 photograph released to the public this week shows a coat and boots sunken in the mud near the Titanic’s stern. Based on the way the clothing items are “laid out,” there is good evidence this was once a person, says James Delgado, director of maritime heritage at the National Oceanic and Atmosphere Administration. The un-cropped photo above shows a coat and boots is neatly laid out which makes a compelling case that human remains rested there somehow. But Titanic filmmaker James Cameron refutes the finding of human remains in the shipwreck. Cameron visited the wreck 33 times, told the NY Times that he had seen “zero human remains” during his extensive explorations of the Titanic. Buried in that sediment are very likely forensic remains of that person.” Delgado added. The Titanic was sailing bound to New York from south of England port but instead it sank in the early morning of April 15, 1912. The photo is provided by the Institute for Exploration, Center for Archaeological Oceanography/University of Rhode Island/NOAA Office of Ocean Exploration via AP.